Help and documentation are always available through our support channels and online forums, but here is a short summary of how to use V·I·S·A Decision Making Software. 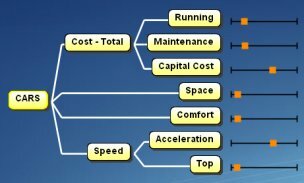 The Value Tree displays the Criteria that are important to you, in a structure that recognizes how the Criteria interrelate. V·I·S·A is interactive - simply drag and drop the criteria around when people in your group think the structure should be different. It's very interactive. i.e. the possible conclusions. In this example, it would be the different cars the person might buy. Score each alternative on each of the criteria in the bottom level of the tree, i.e. 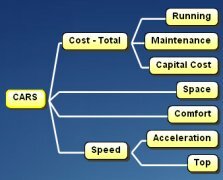 give each of the cars a score (out of 100 in this example) on Acceleration, Capital Cost etc. This can be changed as the user goes through the process, and estimates can always be used. For cost criteria, you would put in the dollars (or other currency) instead of a score. Give each of the criteria a weight to reflect its relative importance. This is a more subjective entry than score. Open up some of the results charts and graphs to see the outcomes. If estimates have been used for scoring, here users can see if those need to be more accurate to improve the results. Users can hide any Alternatives which appear to be unviable, and concentrate on those that are scoring well on the weighted criteria. V·I·S·A has a wizard to help you through each of the steps described above.